Acrylic plastic refers to a family of synthetic, or man-made, plastic materials containing one or more derivatives of acrylic acid. The most common acrylic plastic is polymethyl methacrylate (PMMA), which is sold under the brand names of Plexiglas, Lucite, Perspex, and Crystallite. PMMA is a tough, highly transparent material with excellent resistance to ultraviolet radiation and weathering. It can be colored, molded, cut, drilled, and formed. These properties make it ideal for many applications including airplane windshields, skylights, automobile taillights, and outdoor signs. One notable application is the ceiling of the Houston Astrodome which is composed of hundreds of double-insulating panels of PMMA acrylic plastic. Like all plastics, acrylic plastics are polymers. The word polymer comes from the Greek words poly, meaning many, and meros, meaning a part. A polymer, therefore, is a material made up of many molecules, or parts, linked together like a chain. Polymers may have hundreds, or even thousands, of molecules linked together. More importantly, a polymer is a material that has properties entirely different than its component parts. The process of making a polymer, known as polymerization, has been likened to shoveling scrap glass, copper, and other materials into a box, shaking the box, and coming back in an hour to find a working color television set. The glass, copper, and other component parts are still there, but they have been reassembled into something that looks and functions entirely differently. The first plastic polymer, celluloid, a combination of cellulose nitrate and camphor, was developed in 1869. It was based on the natural polymer cellulose, which is present in plants. Celluloid was used to make many items including photographic film, combs, and men's shirt collars. In 1909, Leo Baekeland developed the first commercially successful synthetic plastic polymer when he patented phenol formalde-hyde resin, which he named Bakelite. Bakelite was an immediate success. It could be machined and molded. It was an excellent electrical insulator and was resistant to heat, acids, and weather. It could also be colored and dyed for use in decorative objects. Bakelite plastic was used in radio, telephone, and electrical equipment, as well as counter tops, buttons, and knife handles. Acrylic acid was first prepared in 1843. Methacrylic acid, which is a derivative of acrylic acid, was formulated in 1865. When methacrylic acid is reacted with methyl alcohol, it results in an ester known as methyl methacrylate. The polymerization process to turn methyl methacrylate into polymethyl methacrylate was discovered by the German chemists Fittig and Paul in 1877, but it wasn't until 1936 that the process was used to produce sheets of acrylic safety glass commercially. During World War II, acrylic glass was used for periscope ports on submarines and for windshields, canopies, and gun turrets on airplanes. Figure 1 shows the polymerization of methyl methocrylate into polymethyl methacrylate (PMMA). Figure 2 shows other acrylic plastic monomers that may be copolymerized with methyl methacrylate. Methyl methacrylate may be formed in several ways. One common way is to react acetone [CH 3 COCH 3 ] with sodium cyanide [NaCN] to produce acetone cyanhydrin [(CH 3 ) 2 C(OH)CN]. This in turn is reacted with methyl alcohol [CH 3 OH] to produce methyl methacrylate. Other similar monomers such as methyl acrylate [CH 2 =CHCOOCH,] and acrylonitrile [CH 2 =CHCN] can be joined with methyl methacrylate to form different acrylic plastics. (See Figure 2) When two or more monomers are joined together, the result is known as a copolymer. Just as with methyl methacrylate, both of these monomers have a double bond on the middle carbon atoms that splits during polymerization to link with the carbon atoms of other molecules. Controlling the proportion of these other monomers produces changes in elasticity and other properties in the resulting plastic. Acrylic plastic polymers are formed by reacting a monomer, such as methyl methacrylate, with a catalyst. A typical catalyst would be an organic peroxide. The catalyst starts the reaction and enters into it to keep it going, but does not become part of the resulting polymer. Acrylic plastics are available in three forms: flat sheets, elongated shapes (rods and tubes), and molding powder. Molding powders are sometimes made by a process known as suspension polymerization in which the reaction takes place between tiny droplets of the monomer suspended in a solution of water and catalyst. This results in grains of polymer with tightly controlled molecular weight suitable for molding or extrusion. Acrylic plastic sheets are formed by a process known as bulk polymerization. In this process, the monomer and catalyst are poured into a mold where the reaction takes place. Two methods of bulk polymerization may be used: batch cell or continuous. Batch cell is the most common because it is simple and is easily adapted for making acrylic sheets in thicknesses from 0.06 to 6.0 inches (0.16-15 cm) and widths from 3 feet (0.9 m) up to several hundred feet. The batch cell method may also be used to form rods and tubes. The continuous method is quicker and involves less labor. It is used to make sheets of thinner thicknesses and smaller widths than those produced by the batch cell method. We will describe both the batch cell and continuous bulk polymerization processes typically used to produce transparent polymethyl methacrylic (PMMA) sheets. Batch cell bulk polymerization is the most common way to make acrylic plasfic sheets because it is simple and easily adapted for making sheets in thicknesses from 0.06 to 6 inches. The mold for producing sheets is assembled from two plates of polished glass separated by a flexible "window-frame" spacer. The spacer sits along the outer perimeter of the surface of the glass plates and forms a sealed cavity between the plates. The fact that the spacer is flexible allows the mold cavity to shrink during the polymerization process to compensate for the volume contraction of the material as the reaction goes from individual molecules to linked polymers. In some production applications, polished metal plates are used instead of glass. Several plates may be stacked on top of each other with the upper surface of one plate becoming the bottom surface of the next higher mold cavity. The plates and spacers are clamped together with spring clamps. An open comer of each mold cavity is filled with a pre-measured liquid syrup of methyl methacrylate monomer and catalyst. In some cases, a methyl methacrylate prepolymer is also added. A prepolymer is a material with partially formed polymer chains used to further help the polymerization process. The liquid syrup flows throughout the mold cavity to fill it. The mold is then sealed and heat may be applied to help the catalyst start the reaction. As the reaction proceeds, it may generate significant heat by itself. This heat is fanned off in air ovens or by placing the molds in a water bath. A programmed temperature cycle is followed to ensure proper cure time without additional vaporization of the monomer solution. This also prevents bubbles from forming. Thinner sheets may cure in 10 to 12 hours, but thicker sheets may require several days. When the plastic is cured, the molds are cooled and opened. The glass or metal plates are cleaned and reassembled for the next batch. The plastic sheets are either used as is or are annealed by heating them to 284-302°F (140-150°C) for several hours to reduce any residual stresses in the material that might cause warping or other dimensional instabilities. 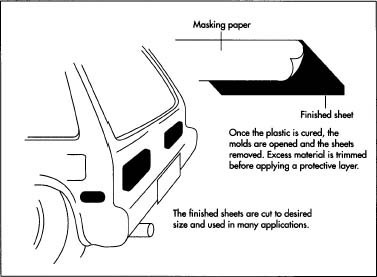 Any excess material, or flash, is trimmed off the edges, and masking paper or plastic film is applied to the surface of the finished sheets for protection during handling and shipping. The paper or film is often marked with the material's brand name, size, and handling instructions. Conformance with applicable safety or building code standards is also noted. The continuous process is similar to the batch cell process, but because the sheets are thinner and smaller, the process times are much shorter. The syrup of monomer and catalyst is introduced at one end of a set of horizontal stainless steel belts running parallel, one above the other. The distance between the belts determines the thickness of the sheet to be formed. The belts hold the reacting monomer and catalyst syrup between them and move it through a series of heating and cooling zones according to a programmed temperature cycle to cure the material. Electric heaters or hot air may then anneal the material as it comes out of the end of the belts. The sheets are cut to size and masking paper or plastic film is applied. The storage, handling, and processing of the chemicals that make acrylic plastics are done under controlled environmental conditions to prevent contamination of the material or unsafe chemical reactions. The control of temperature is especially critical to the polymerization process. Even the initial temperatures of the monomer and catalyst are controlled before they are introduced into the mold. During the entire process, the temperature of the reacting material is monitored and controlled to ensure the heating and cooling cycles are the proper temperature and duration. Samples of finished acrylic materials are also given periodic laboratory analysis to confirm physical, optical, and chemical properties. Acrylic plastics manufacturing involves highly toxic substances which require careful storage, handling, and disposal. The polymerization process can result in an explosion if not monitored properly. It also produces toxic fumes. Recent legislation requires that the polymerization process be carried out in a closed environment and that the fumes be cleaned, captured, or otherwise neutralized before discharge to the atmosphere. Acrylic plastic is not easily recycled. It is considered a group 7 plastic among recycled plastics and is not collected for recycling in most communities. Large pieces can be reformed into other useful objects if they have not suffered too much stress, crazing, or cracking, but this accounts for only a very small portion of the acrylic plastic waste. In a landfill, acrylic plastics, like many other plastics, are not readily biodegradable. Some acrylic plastics are highly flammable and must be protected from sources of combustion. The average annual increase in the rate of consumption of acrylic plastics has been about 10%. A future annual growth rate of about 5% is predicted. Despite the fact that acrylic plastics are one of the oldest plastic materials in use today, they still hold the same advantages of optical clarity and resistance to the outdoor environment that make them the material of choice for many applications. Baird, Ronald J. and David T. Baird. Industrial Plastics. The Goodheart-Willcox Company, 1986. Cowie, J.M.G. Polymers: Chemistry and Physics of Modern Materials. Chapman and Hall, 1991. Encyclopedia of Polymer Science and Engineering, Volume 1. John Wiley & Sons, 1985. Rosato, Dominick V. Plastic Encyclopedia and Dictionary. Hanser Publications, 1993. Seymour, Raymond B. Engineering Polymer Sourcebook. McGraw-Hill, 1990. Smith, Edward H., ed. Mechanical Engineer's Reference Book. Society of Automotive Engineers, 1994. I'd say that the catalyst does in fact become a part of the finished polymer chain. An organic peroxide, such as benzoyl peroxide (commonly used in polymer chemistry) will degrade from heat to form free radicals, which will react and combine with a monomer, forming a new, reactive free radical, which will in turn react with another monomer unit and so on. The peroxide is therefore usually called an initiator rather than a catalyst. An initiator of some sort is always needed in order to start a polymerization reaction, and is always present in what is called the alpha end of the final polymer chain. I was wondering whether you may know if drinking glasses (water, soft drinks) made from 100% acrylics leach any unreacted monomers or initiators in normal use. Further, if the glasses are colored, might they leach the coloring agent? Can you suggest any references? i need to start a project for the manufacturing of accessories such as home accesories Chairs tabels etc.. and other home accessories trayes, plates, ash trays etc..., and would like to know the required machines and the required space. I have been given some sheets of acrylic as a means of protecting a timber retaining wall from the effects of water. Does anybody here know if these acrylic sheets can be harmful to the soil as I plan to raise a garden bed on that soil. Any advise is much appreciated. 1. Where should I find the specifics on heating cycles? 2. Can I mix my dye with its solvent and then add it to the monomer and catalyst? How should I make it homogenous?